As an upgrade for my Navio2 configuration, with latest Arducopter 3.5.0-rc2 software, I will use 2 GPS units. UART and I2C plugs are free on the Navio. I stream telemetry via USB. 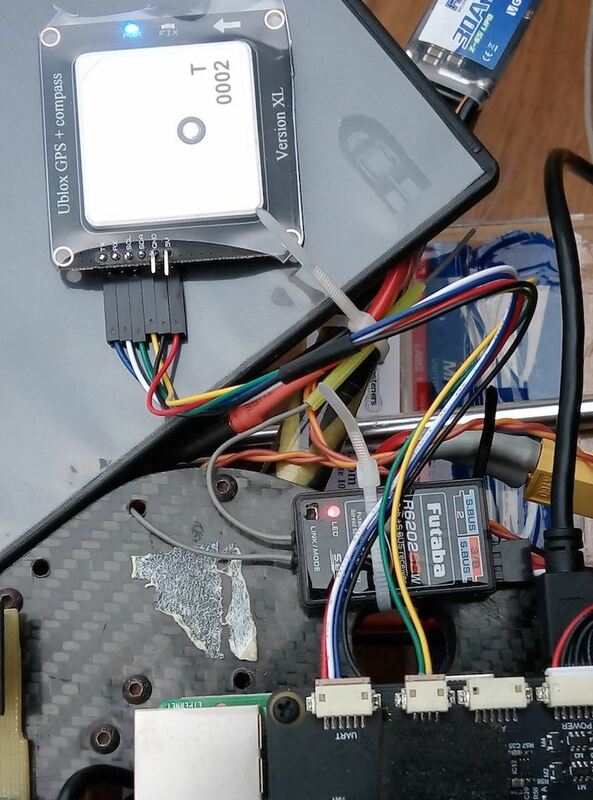 ARDUPILOT_OPTS="-A udp:192.168.1.29:14550 -C /dev/ttyUSB0 -E /dev/ttyAMA0"
In Mission planner parameter list, GPS_TYPE2 is set to 1 (Auto), GPS_AUTO_SWITCH is set to 1 (enabled), SERIAL4 is set for GPS at 38400. External GPS compass is set as Compass #3, with Roll180. Not yet calibrated by heading is coherent. Under my roof window, GPS detection is quite fine on the two units. At the field I have around 14 sats with Navio GPS. I will have to wait a few days (bad weather). showing hdop for GPS1 & GPS2 please ? I’m looking to upgrade the Navio GPS firmware. No way to do it with the Pi application. So I will try with FTDI and Rx-Tx pins on the chip. You might try our TCP bridge utility. There’s a chance Ublox supports updates over SPI. If it doesn’t work out for you, you can use the FTDI approach. I tried twice, second time after disabling ardupilot. Flash process seems to be OK but there is no end after the blue bar is full. After cold start, firmware is still 2.0.1. I keep you in touch for the serial flash result. No way to use UART when SPI interface is enabled (Pin 2 to Ground). Above my pay grade. I will wait next Navio version with USB plug integrated (or SPI working upgrade procedure). 2nd GPS experiment going fine. There are some limitations (performance) with the M8N. 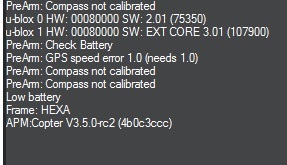 According to uBlox documentation, M8N with firmware 3.01 can be configured to scan GPS, GLONASS and Galileo constellation, but with a refresh rate of 3Hz, below the 5Hz minimum of Arducopter. 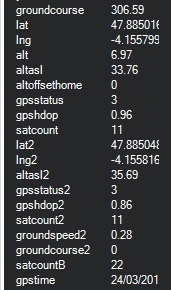 So I choose to configure the external GPS with GPS, GNSS and sBas, at 5 Hz, like the internal one. Today I had a try at latest 3.5-rc8 Arducopter version. There is a little video of the second flight (airborne) with Stabilize mode Take-Off, Pos hold, some translation, one U-Turn and RTL sequence.